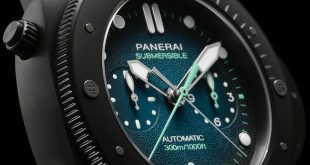 If you had a chance to watch our interview with new Panerai CEO Jean-Marc Pontroué, you will have noticed that he had a clear vision for the brand and a lot of that was geared towards the Submersible line. 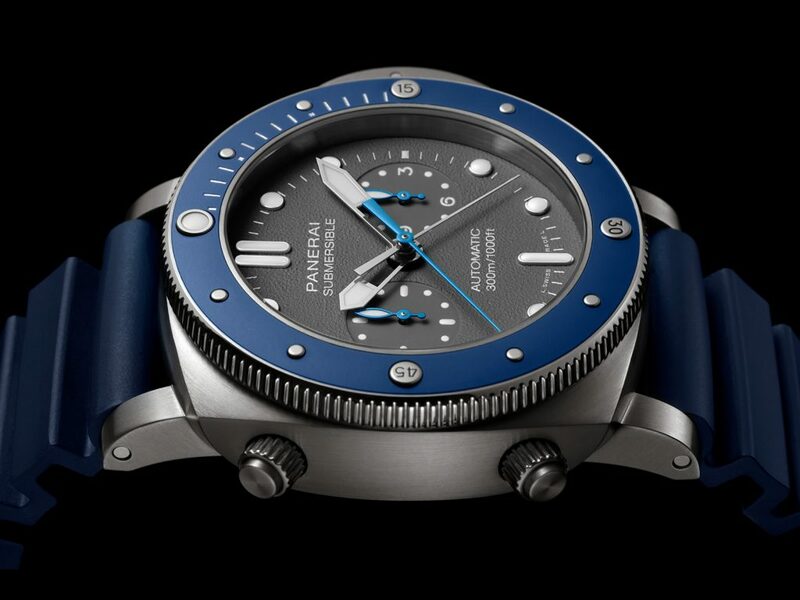 He continues this sentiment with the latest addition to the Submersible line the PAM982 Guillaume Néry Edition. 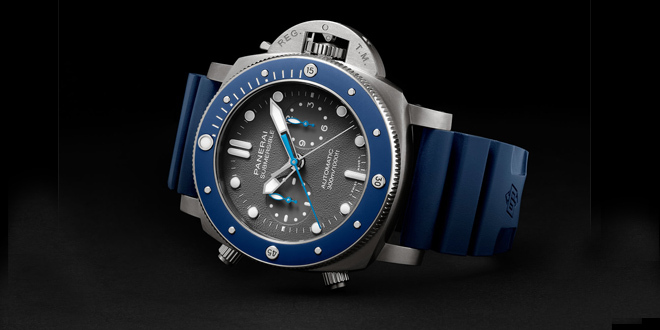 This model was exclusively designed and produced with divers in mind with the help of world record holder free diver Guillaume Néry. 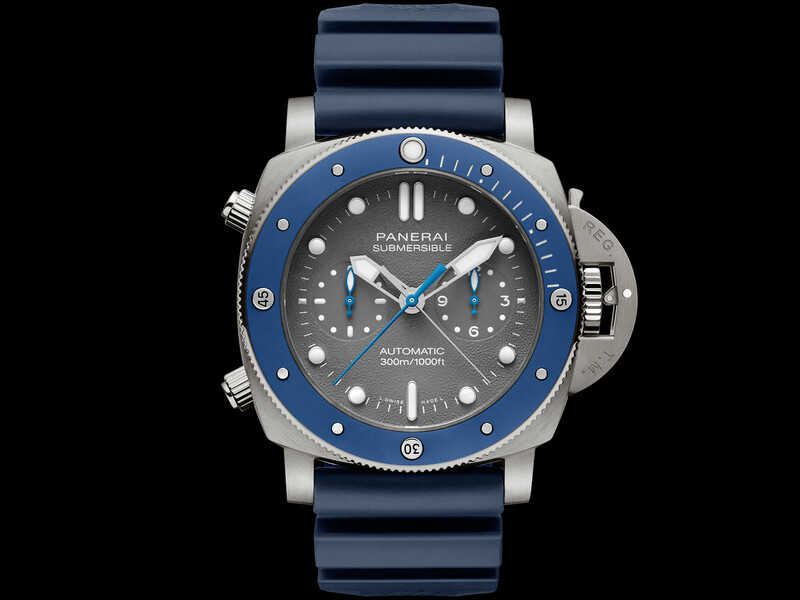 Panerai’s latest ambassador embodies a lot of what the brand holds dear to it’s DNA, a rich diving history and exploring beyond the known. 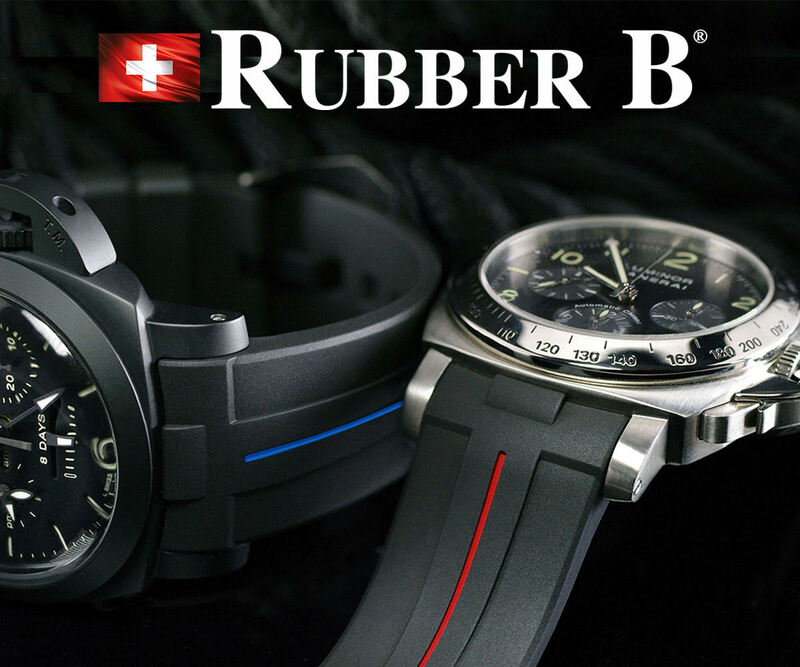 The PAM982 features 47mm diameter case that is made out of titanium which saves a lot of weight for such a sizable watch. 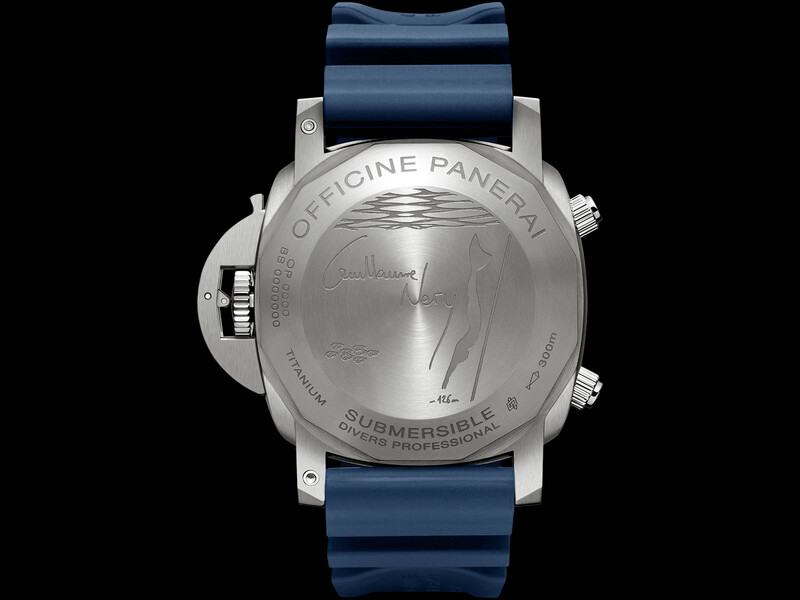 The watch is water resistant up to 300 meters and features for the first time a dark blue uni-directional ceramic bezel to keep track of dive time. The dial on this piece introduces a new style to the Panerai lineup, featuring a textured shark grey colored dial that almost looks a lot like the bottom of the ocean floor with gravel and sand. Complimenting the dark blue ceramic bezel, the chronograph function and sub dial hands are done in the iconic Panerai light blue that we have grown accustom to on a lot of the newer pieces. 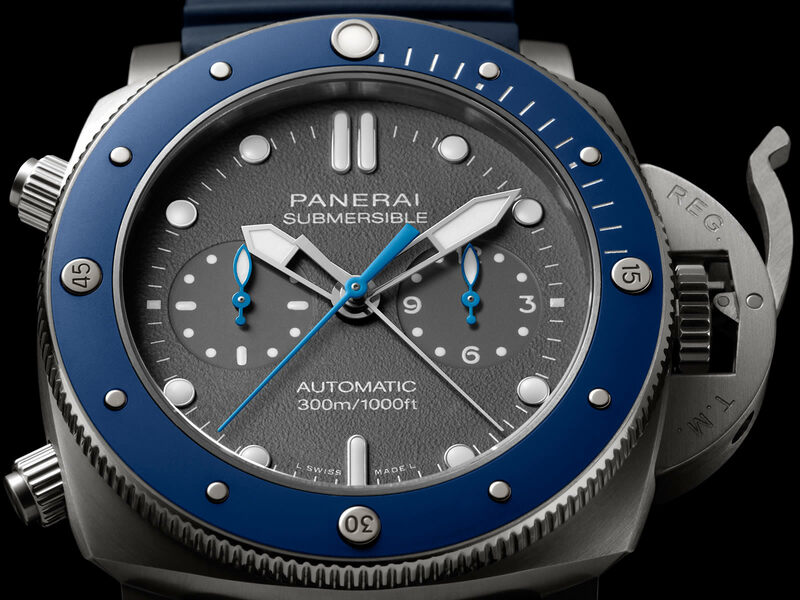 The PAM982 features a blue Super LumiNOVA as opposed to the typical green that we see on many other Panerai pieces. 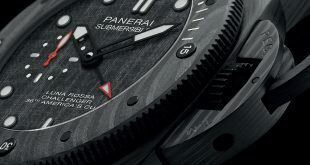 This particular submersible like the PAM615 features screw down chronograph pushers to ensure that the watch can withstand the 300M rating that it comes with. 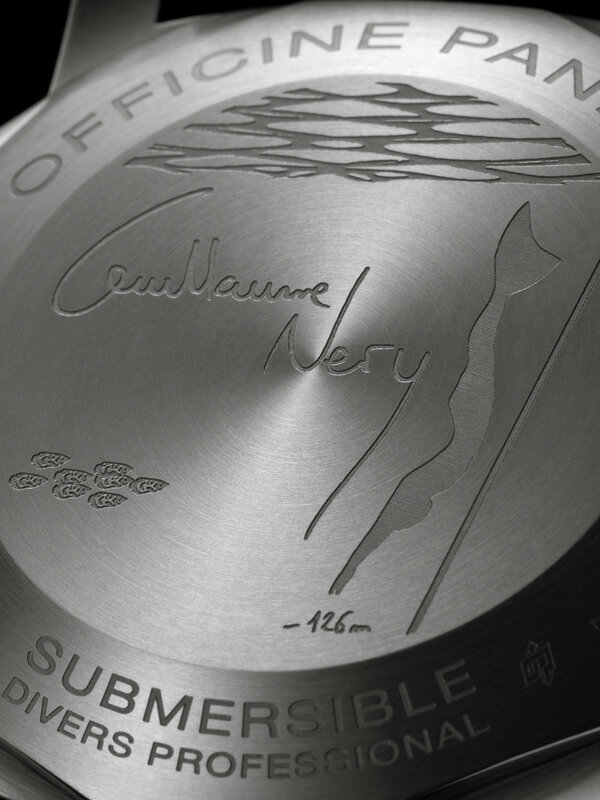 Finishing it off is a lightly domed crystal and a solid titanium case back that is etched with an illustration of Guillaume Néry setting the record for the deepest dive on one breath of 126 feet. 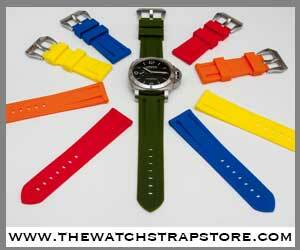 The watch comes on one of the newer Panerai blue rubber straps to match the blue accents on the actual watch. 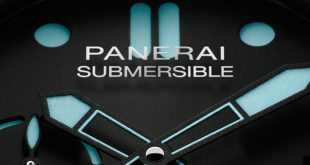 I do have to say that I wish that Panerai had decided to actually match all of the blue tones on the watch to make it a bit more fluid. I would have been happy if all of the blue were the same color as the dark blue ceramic bezel. 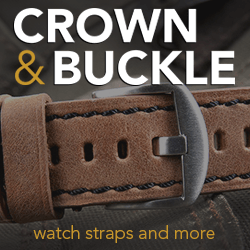 Currently the way that the watch is setup, you have essentially have 3 different shades of blue between the bezel, hands, and strap. 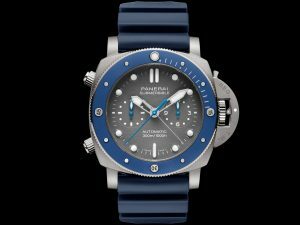 From initial responses to the watch, which have been very favorable, some enthusiast actually like the contrast of all the blue on the PAM982 and believe it gives it a bit of character. In no way is it a deal breaker for me on this piece, but just a minor annoyance. 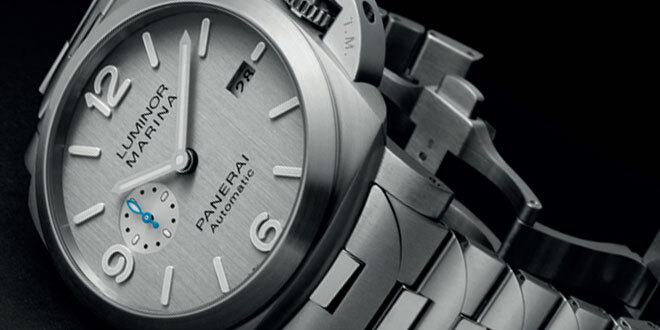 Powering the PAM982 is the workhorse P.9100 Calibre manufactured in-house in Neuchâtel, Switzerland. It features 37 jewel self winding chronograph movement that beats at 28,800 vph with a 3 day power reserve when it is fully wound. Along with the Flyback Chronograph feature, the P.9100 also comes with a reset-t0-zero function that allows you to synchronize the watch with much effort.